VIM in my muscle memory is one of my popular posts, the day I published it, I attracted over 3,200 unique views in a single day, mostly from Hacker News and Reddit Programming. Although it is an extremely densely packed post with lots of information, I hope it has helped some to appreciate VIM like I do. https://github.com/jpo/vim-railscasts-theme – the original GUI only theme by Josh O’Rourke. https://github.com/vim-scripts/Railscasts-Theme-GUIand256color/blob/master/colors/railscasts.vim – as the name suggests, this is an extension of the original theme by Josh O’Rourke with sane 256 color equivalents for terminal vim written by Nick Moffitt. I have tried both versions, but there are several inconsistencies between them. I also tried using Josh’s version along with csapprox, but I did not like some of the color conversions made by it. It was simply not ‘coherent’ enough for my liking between the gui & terminal. Also some of the elements of Nick’s version in the terminal were annoying, for eg.) the default (Normal) background for terminal in Nick’s version was transparent. I use a terminal with transparency so I can often read stuff from my editor in the background or even the browser, but this does not work well with my editor, when I am coding I would not like the distraction of anything behind my code. This entry was posted in Technology and tagged colorscheme, railscasts, vim on March 8, 2013 by dhruvasagar. One of the most common things to do in any standard rails web applications is auto-completion. One interesting solution to this is by using redis’ (which is blazing fast) sorted sets, storing key value pairs for partial matches. For example, if we wish to index the word ‘Dhruva Sagar’ (my name), you can simply create key -> value pairs of ‘d’ -> ‘Dhruva Sagar’, ‘dh’ -> ‘Dhruva Sagar’, ‘dhr’ -> ‘Dhruva Sagar’ and so on. Since hash lookups are of constant time complexity O(1), they’re very fast and hence the completions are too! Combine this with using sorted sets of redis to easily order / sort information on a specific criteria and you have a blazing fast solution. Of course the actual implementation can be further optimized by means of caching query results and make the system perform even further. Soulmate is a cool gem by the guys at SeatGeek that provides a pretty cool implementation of the same. However it’s implementation wasn’t quite a good fit for my case since I wanted to work with a rails application and didn’t want to either host a separate server or mount the provided sinatra app inside of rails. I came across this nice post by Pat Shaughnessy – Finding your soulmate: autocomplete with Redis in Rails 3.1 which showcases how one can use the Soulmate gem and use it’s API to roll out your own auto-completion engine within your rails 3.1 application very easily. This inspired me to fork Soulmate and extend it to build a Soulmate Rails gem over the weekend which provides a clean and intuitive API to do this from within Rails. Please do check it out, star it, fork it and use it to your hearts content . I’ve released it in alpha phase right now but it is fully usable with a reasonable test coverage. I’ll be contributing a lot to this, hopefully you find it useful too. UPDATE : I released the first stable version 0.2.1, it should be usable as is without any issues. This entry was posted in Technology and tagged autocomplete, autocompletion, rails, redis, ruby, search, soulmate on March 4, 2013 by dhruvasagar. Tmux Powerline is an extension to tmux’s statusline which makes it look incredibly cool. Look at this screenshot. This entry was posted in Technology and tagged powerline, tmux, ubuntu on February 23, 2013 by dhruvasagar. Recently I have been experiencing a very weird issue on my Macbook Pro, I have Lion v10.7.4, with a decent configuration – 2.8 GHz Intel Core i7 processor, 8GB Ram with a 750GB sata hard disk. But over a reasonably prolonged period of usage, of around 4-6 hours, I notice from time to time that Mac OSX runs completely out of RAM! The Activity Monitor reports mere MBs of Free Memory, sometimes even less than 10MB. Needless to say this makes the Macbook loose it’s mind, it would freeze up on random, seemingly basic tasks, even switching to a window can freeze the macbook for minutes, if not hours. Which is understandable, though, given how low memory it is left with. This entry was posted in Technology and tagged chrome, memory, ram on August 28, 2012 by dhruvasagar. I have been an ardent VIM user for almost 4 years now, and it’s been a while since I have been wanting to write this Blog. My motivation is not to showoff or to start any flame war against any other popular text editors that may or may not be better ;), but to simply showcase the things I like and have come to appreciate in VIM, and show why you should seriously consider it when deciding which programming editor you should use. 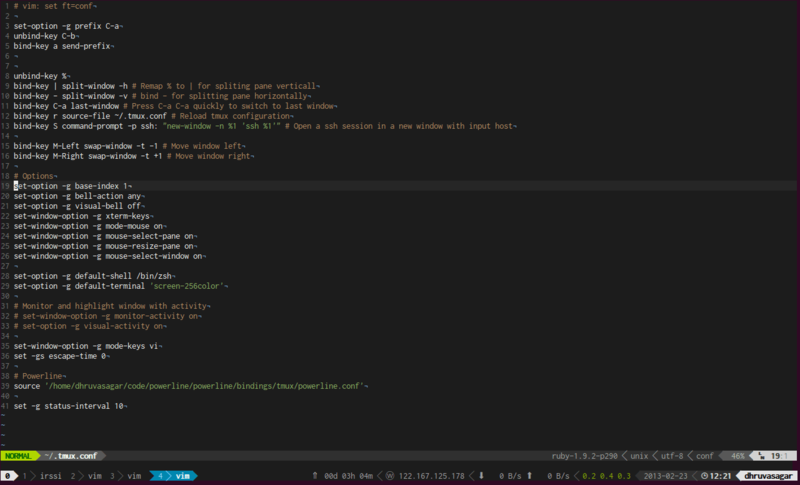 Hopefully I will be able to do justice to VIM – the Ultimate Programmer’s Editor. The beauty about using VIM is that it converts the task of text editing / manipulation into a programmable activity. It provides you with a framework to work with your text in a way which allows you to think of it in terms of simple patterns, patterns which you can repeat, store (macros), copy & even combine together. This also makes the process of learning VIM interesting & fun! Add to that the fact that you can easily extend your VIM with a wide variety of plugins & themes contributed and shared openly by a vibrant community is just icing on the cake! Initially when you start out with VIM it feels quite alien and ancient to say the least, also because the default configurations in VIM aren’t that optimal, so it might take a few days to get a hang of things, but once you do, it will motivate you to do things faster. The more you do, the more you obsess on doing things faster and with fewer and fewer keystrokes as possible (you might want to have a look at http://vimgolf.com for a bit of fun in that respect :)), the more you discover what VIM has to offer. Over a prolonged period of usage, slowly and steadily VIM commands creep into your muscle memory and the vastness of the abilities and features of VIM which overwhelm you in the beginning, come to you as second nature. This is my attempt to describe various elements of VIM that are now in my muscle memory and use them on a daily basis. This entry was posted in Technology and tagged ruby, vim on August 24, 2012 by dhruvasagar. There has been tremendous advancement in the domain of Artificial Intelligence (AI) and Machine Learning (ML) in the recent years. Although people often like to take a shot at the state of AI on the grounds of the fact that several of the early claims on AI that it will soon become almost as real as humans haven’t really materialized, there still has been an incredible amount of growth in this domain. Today AI is a bigger part of our daily lives than we realize. For instance every time I search for something on google, google remembers what I searched for and makes informed, calculated decisions in the future based on my search history. Often when searching for the same search pattern, it is likely that the search results I receive might be marginally different than yours because of google’s AI / ML algorithms, who try to understand my search queries in the context of my search history, and decide what I might be more interested in, usually based on things that I search most often about, things I like more based on search results that I clicked on, etc. I have often been rather vary of the implications of such a system and find myself going to incognito window to search when I wish to search for things that I don’t want to be associated with, a prime example of this would be when I am trying to validate some viral news. Now given that I am generally always online on google, and given the understanding of how AI’s might work and evolve, I was thinking about a side effect that might be possible to tap into by modern spyware. A spyware could simply just sit on my system and make google searches in the background with specific keywords. It could make 1000s, 10s of 1000s of searches in the background on my behalf and hence gradually, so to speak, train google’s AI / ML algorithms into believing that I am really interested in something that I really am not. Google’s case is just one of many such services who make use of AI & ML, most recommendation systems make use of AI & ML to learn about my choices and recommend things that I might like, advertising platforms also make use of a similar approach to target users with ads of things they might be interested in and so on. This could very well be a reality today, it is quite possible a similar approach is already being used by several Spyware to manipulate such artificially intelligent systems by feeding them wrong information and hence indirectly influencing their decision making. The disturbing point to note about such an approach is the fact that it is virtually impossible to undo the damage that has already been done. This entry was posted in Technology and tagged AI, Artificial Intelligence, Machine Learning, ML, Spyware on August 21, 2012 by dhruvasagar. Showcasing how to calculate hashes in Java, C# and Ruby! This entry was posted in Technology and tagged c-sharp, c#, csharp, hash, java, md5, programming, ruby, sha1, sha256, sha384, sha512 on November 25, 2010 by dhruvasagar.